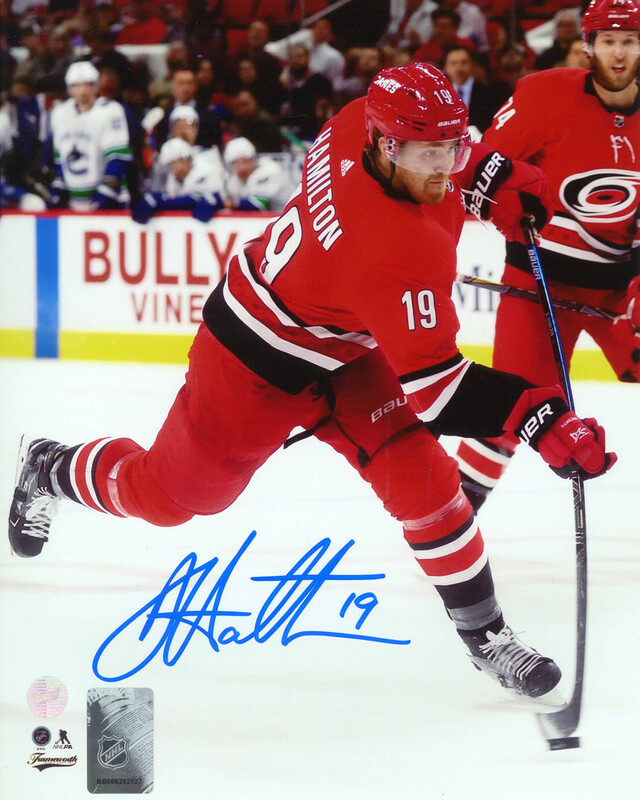 The 8x10 Carolina Hurricanes action shot photo has been personally autographed by Hurricanes defenseman Dougie Hamilton. This picture was taken during the Carolina Hurricanes versus Vancouver Canucks game on October 9, 2018 at PNC arena in Raleigh, North Carolina. This would be Hamilton's fourth game in a Hurricanes uniform. Hamilton played a solid 18 minutes and had an assist on Andrei Svchenikov's second goal of the season to help the Hurricanes top the Canucks 5-3. Dougie Hamilton began his NHL career when he was drafted ninth overall in the 2011 NHL Draft by the Boston Bruins. He would make his NHL debut a year later during the 2012-2013 NHL lockout season, on January 19, 2013. In that shortened season Hamilton got a taste of what it takes to win the Stanley Cup, Hamilton and the Bruins made it all the way to the Stanley Cup Final in 2013 but would be defeated by the Chicago Blackhawks. Hamilton would play another two seasons in a Bruins uniform, until he became a restricted free agent after the 2014-2015 season. As talks with Boston were not going very far, this saw Hamilton be traded to the Calgary Flames. Hamilton would play 3 seasons in a Flames uniform. In his second last season as a Flame in 2016-2017 he helped lead the Flames to the Stanley Cup Playoffs, finishing the regular season with a career high 50 points. He would spend one more season in Calgary before being traded to the Carolina Hurricanes on June 23, 2018. Currently, Hamilton has played in a total of 449 NHL games, scoring 67 goals and 162 assists for a total of 229 points and counting. Over the course of his seven NHL seasons he has played so far, Hamilton has four seasons with 40 or more points. Notably, he has also represented Canada during the 2012-2013 season at the World Junior Championships. He averaged even better than a point per game and helped Canada bring home a bronze medal. This signed photo is perfect for any Hurricanes or hockey fan alike. A Frameworth hologram and certificate of authenticity are both included to ensure the legitimacy of the autograph. Frameworth is the exclusive autograph provider of Dougie Hamilton memorabilia.